How Was The Crash For You? Did you survive the crash ok? Did you feel it at all? A market crash is defined as a drop of 20% or more. 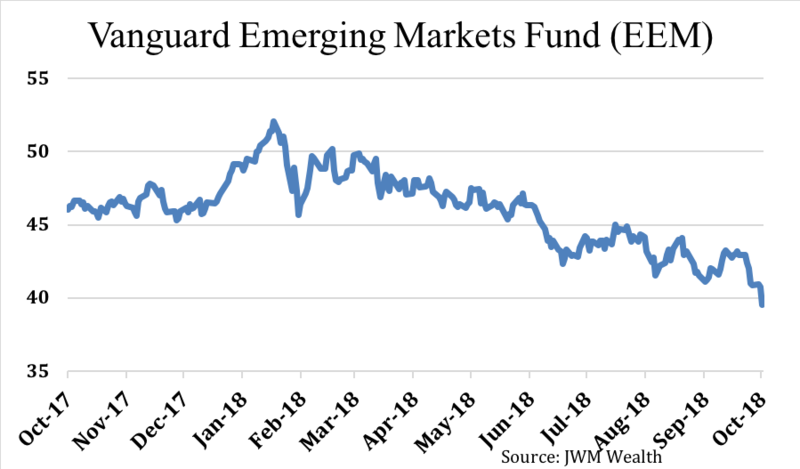 The recent activity on trade agreements has sent global markets plundering, with the Vanguard Emerging Markets Index Fund falling nearly 25% as of this writing on October 10. A diversified portfolio that holds both large and small US stocks along with international developed and emerging markets stocks will, by definition, give you the average return of these individual pieces, weighted by the percentage that you hold in each. Our process leads us to a portfolio that holds more than 10,000 companies worldwide. We can’t help but earn the average of the world markets.And that is, in fact, what we are trying to do. So, you might think that with Emerging Markets in crash territory, the overall portfolio has suffered great damage. But this isn’t so. US stocks and bonds have held as a counterbalance while non-US stocks have become cheaper – I mean, gone down in price. Being diversified means never coming in first or last place. But more importantly, it means never losing “everything” while earning a predictable return over the long run. When one market crashes while others do not, it causes imbalances in our portfolio. In other words, we get off-target and it’s time to rebalance. That means, we sell the sectors that have done better (the “high” ones) and buy the sectors that have done worse (the “low” ones). This discipline of selling high and buying low should sound familiar, but it’s not always easy to see in real time.